Like Capriccio, Sibyls is a very large folio edition. In part, the size points to the roots of Baskin’s project in a sculptural series of winged sibyls he had been carving from wood. The dramatic, large woodcuts were printed from as many as five woodblocks to achieve the stunning colors. The poet Ruth Fainlight was inspired by Baskin’s sibyl figures to write more than one series of poems. 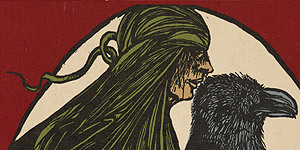 Baskin and Fainlight worked together on a number of projects in which sibyls were featured, but this was the only one published by the Gehenna Press.